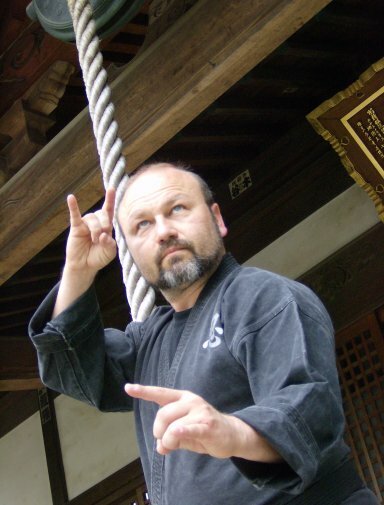 Are Bujinkan Students Ignorant of Ninja History? You've received this because you are subscribed to the Warrior Concepts Newsletter from Shidoshi Jeffrey Miller. If you no longer wish to receive these informative messages from us, you may unsubscribe at the bottom of this message. REMEMBER: Power is created by motion and flow. Add power to your own experience and knowledge by passing this newsletter on to others. Are You Ignorant of Your Ninja History? (C) 2008, Warrior Concepts Int'l, Inc.
...they have no idea whatsoever of the power, tradition, and history that lies behind what they profess to know so well. It's kind of like the average American and their history. Before you freak out, yes, I'm an American, a former veteran, and very proud thank you very much. ...all without a clue about how these things came about. ...you will have to go through the same trial-and-errors they did. ...a lot of people died in the process of learning this stuff! ...who are their teachers? And, more importantly, if these so-called "masters" know what they're doing, why aren't they teaching more than whatever cool lesson they picked up at their last visit to Japan (as if their students were ready for those lessons, anyway!). Why am discussing history and then ranting about what students aren't getting? Good question. ... didn't originally look like they're being shown today. Let's forget those things - but only for a minute. ... there is a whole lot of power and connection that today's students are missing. Seriously. Can you imagine Christians or Buddhists learning and practicing... without learning anything about Jesus or Siddhatha Gautama (the historical figure first referred to as a Buddha - "one who is Awake")?! When I take my students to Japan every year, they do much more than "go to class." They also immerse themselves in the culture, history, and traditions that lie at the foundation and creation of this very powerful martial art. If you want more information about our yearly Japan training adventures, you can read more at www.warrior-concepts-online.com/japan-trip.html, send me a request via the contact form on the web site, or call the academy at (570) 988-2228. Over the next few issues, I'm going to be discussing some of the places that we visit, like the area on top of Togakushi Mountain (modern-day Togakure) where the sect's founder, Daisuke-Nishina, studied when he was a student just like you. And, you know what? I have yet to have a student visit that spot and NOT feel a new sense of connection and empowerment! In addition to discussing places like the 3 shrines atop Togakushi, the Nighting Gail(?) floor inside Nijo Castle in Kyoto, and the home of the warrior-monks of Hie-zan, I'll also be sharing with you a bit about some of the master instructors that I regularly train with, and why I choose to train with them. You owe it to yourself to learn as much as you can about yourself, your world, and your martial art. I can only help marginally with the first 2, but I would be negligent as a teacher if I didn't do everything I could to make sure that you got a handle on the history and "reason" behind ninjutsu - the most powerful martial arts and self-defense systems ever developed by man! Join me and other guest master instructors of the art of Japan's ancient Ninja Warriors from 8pm Friday evening, through 5pm Sunday afternoon for a weekend of training in the Ninja's self-protection and life-enhancement skills! The focus of this year's O-Matsuri `Festival`, are the skills, tactics, philosophy, and techniques of the Togakure-Ryu (`School of the Concealing Door`) Ninja. During this intense weekend of training, you will train with senior teachers of the art, each with almost 30 years of training EACH! The cost of this year's camp is just $199, and includes all training, lodging, meals, and a commemorative T-shirt. BUT... if you register and pay in-full by August 20th, 2008, you can save an amazing $99 off the price! That's almost 50% off. But remember: To receive this discount offer, payment in-full must be received NO LATER THAN August 20th! Checks will be held for bank clearance before registration is complete. **The price of camp DOES NOT include transportation. Particpants will receive a detailed camp packet as soon as we receive your registration and payment information. Kuden Radio Show Goes Live! That's right! KUDEN, my all new online radio show goes live on Wednesday, August 20th, 2008! Want to be one of the first to get access to this landmark and historic event? All you have to do is subscribe using the form on the online ninja training page. It's free to download the show! ...you'll get my take on "How to become a warrior"
If you want to be notified when a new show is ready, you must add yourself to this special list. Otherwise, you will have to wait until I send out messages like this. ...go here: www.warrior-concepts-online.com/online-ninja-training-podcast.html to subscribe. If the link doesn't work for you, just copy and paste into your browser. Do you have your copy of my new Togakure-Ryu Senban Shuiken Training Manual yet? You can get it and more information on the shuriken - Ninja throwing star by using this link. Just remember to keep your communications clear and to the point (limit each correspondence to ONE point, please). Any comments or questions received that are not easily understood or rife with spelling and grammar errors will be deleted. It's not that I don't want to answer but, if I can't understand your point or what you mean, I can't answer in a way that will be beneficial. Until next time. Dedicated to your training success!